Foresee: Process dictates product. To design for equity, we must design equitably. The practice of equitable design requires that we are mindful how we achieve equity. Inclusive design practices raise the voices of the marginalized, strengthen relationships across differences, shift positions, and recharge our democracy. It is the aim of my March + April 2018 Interactions article “Afrofuturism, Inclusion, and the Design Imagination” to architect a case for Afrofuturism as a speculative design lens in human-centered design (HCD), articulating the whats and whys of engaging Afrofuturism in conceiving and developing inclusive and equitable future technological solutions. The natural next question is how? How can the human-centered designer engage—now—with Afrofuturism? A proposed taxonomy (Figure 1), developed in collaboration with graphic and interaction designer Zane Sporrer, begins to frame this how. 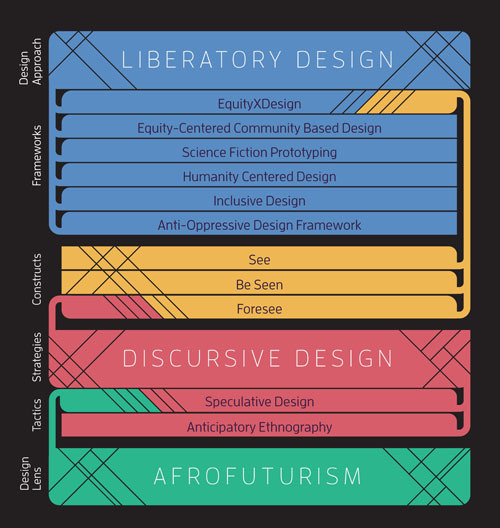 This taxonomy, depicted with a specific focus on connecting Afrofuturism with the equityXdesign framework, situates Afrofuturism as a design lens in executing liberatory design frameworks, those similar framings (e.g., humanity-centered design, inclusive design, and the anti-oppressive design framework) that incorporate equity work within HCD. 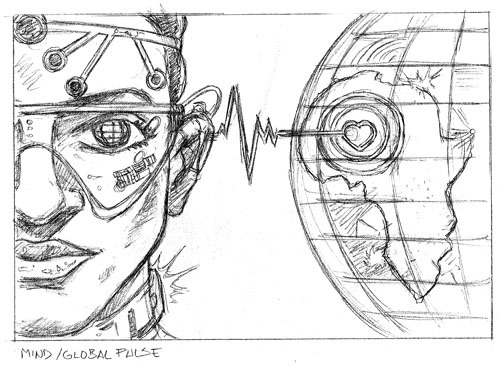 In enacting the construct of “foresee” within the equityXdesign framework, Afrofuturism functions as a mechanism for focusing substantiating discursive design tactics like speculative design in imagining concepts, with an intent to offer design artifacts that provoke and trigger more inclusive conversations about both user and context of use. As detailed in my Interactions piece, this mode of engaging Afrofuturism in speculative design is reflected in my efforts around more inclusive connected fitness technologies (devices). Figure 2, conceptualized in collaboration with artist Marcel L. Walker, reflects an exemplary speculative design artifact. Inspired by a core tenet of Afrofuturism, collectivism, and the Afrofuturistic imagery of the warriors of the Dora Milaje—Wakanda’s Special Forces, as depicted and featured in Marvel’s film Black Panther— this artifact conveys the importance of community and the value of connecting visually to a greater Black collective in contextualizing and motivating increased individual physical activity levels. While it is not the intent that this concept be implemented as imagined, this artifact, as a speculative probe, fosters design conversations that enrich the plausible solution space. From an interaction design perspective in particular, deeper discussions around ways that data and information offered by connected fitness devices can be better synthesized, situated, and visualized are spurred. As the type and nature of insights traditionally offered by these devices are more quantitative in nature (e.g., number of steps taken), this concept, as probe, inspires thoughts around more qualitative representations of insights in motivating increased physical activity levels. This has been demonstrated in the successful efforts of GirlTrek, an organization that inspires black women to change their lives and communities by walking, situating one’s step count within a historical context. Efforts such as Girltrek’s recent #HarrietsGreatEscape initiative (where participants are challenged to walk 100 miles between March 10, 2018 and May 10, 2018, symbolic of Harriet Tubman’s journey along the Underground Railroad) could better motivate increased physical activity levels, particularly among marginalized groups such as black/African-American women, for whom considerable health disparities exist. As is indicative of speculative design, immediate outcomes are not typically commercially viable or usable; further grounding is necessary. Hence, in continuing the example of more inclusive connected fitness devices where the voice of black/African-American women is placed central in the design narrative, look to the conceptual and empirical works of Andrea Grimes Parker, director of the Wellness Technology Lab at Northeastern University. Works such as her March + April 2013 Interactions article “Designing for Health Activism” help in evolving and maturing the design conversation. This ultimately seeds more inclusive and novel plausible solutions for further iteration and eventual refinement. exposure to difference changes perspective, and increases tolerance. That’s why it matters so much that marginalized groups are validated within our interfaces. Because if technology has the power to connect the world, as technologists so often proclaim, then it also has the power to make the world a more inclusive place, simply by building interfaces that reflect all its users. Thus, the need for human-centered designers to both develop and engage with tools, methods, and practices that support this premise is paramount. Afrofuturism represents such a tool—a design lens—through which the requisite intentionality and actions can be both catalyzed and implemented. I am both excited and encouraged by recent feedback from my Interactions article to continue this conversation. In particular, I invite the use of my thoughts concerning the engagement of Afrofuturism in HCD as a probe in advancing the continued evolution of the needed methodological rigor in increasing inclusivity and thus equity within the culture, processes, and outcomes of HCD. The consequences are great, especially as technology is becoming more deeply engaged in our daily lives and activities. For, as now being witnessed, design patterns, behaviors, and norms are being embedded and reinforced within HCD that, while unintentional, may lead to future technological solutions that do more harm than good.